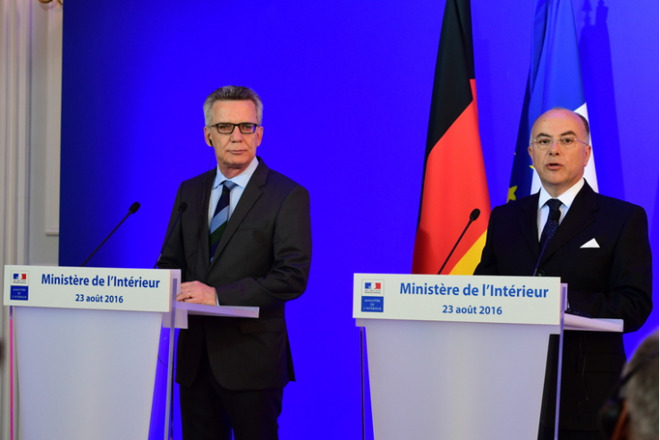 In a joint press conference in Paris on Tuesday, the interior ministers of France and Germany called on the European Commission to enact laws that would give countries on-demand access to encrypted communications under some circumstances. Exchanges via some apps "must be able, as part of court proceedings —and I stress this —to be identified and used as evidence by the investigation and magistrates services," said France's Bernard Cazeneuve, according to TechCrunch. Both countries have been hit by a slew of Islamist terrorist attacks in the past year, killing hundreds of people. Some of the terrorists have relied on apps like WhatsApp and Telegram to communicate —because both use end-to-end encryption, however, even their developers can't decipher message content. Cazeneuve and his counterpart, Thomas de Maizière, would like the European Commission to have laws enforcing the same rights and obligations for internet services and telecoms operators across Europe, even if they're not headquartered in the European Union. The ministers want their proposals discussed at a September Commission meeting. If brought into force, such regulations could create serious issues for tech companies like Apple, which uses end-to-end encryption for iMessage content. Effectively, the rules would bar end-to-end encryption entirely, since there's no way of inserting a government-only backdoor into such systems. They're already encountering opposition from the Computer & Communications Industry Association, and would run counter to July recommendations by the E.U. 's own data protection supervisor, who said that an upcoming update of ePrivacy directives should protect end-to-end encryption, and specifically prevent "decryption, reverse engineering or monitoring of [encrypted] communications."